After two and half years of blogging I decided that I needed to get over my fear of having myself photographed. I have never liked photos. I inherited my dad's rather large nose (thanks dad!) that in photographs looks horribly large. I have become great over the years in making sure I am looking down or having my hair cover most of my face. However, as my boys have gotten older I have realized a number of things. I lost both my mother and grandmother to cancer. Once someone is gone all that you are left with are the memories you have stored and photographs. I don't want my kids to remember me without a photograph to remember my face. I want them to be able to show their grand children what I looked like and take pride in where they came from. So I've come out from behind the camera. I promise this was not an easy decision, I still cringe at my photos, but I am slowly getting better. Now that you know my face, on to the recipe. This week my two boys have been in day camp at the library so I have been baking a number of snacks for when they come home in the afternoon. Yesterday I tried a new recipe for Oatmeal Cranberry White Chocolate Chunk Cookies. This recipe has 9 ingredients. It takes 20 minutes of total time, 10 minutes of which is active and makes 2 1/2 dozen cookies. I only made a few changes to the original recipe. First, I doubled the amount of white chocolate chips. My two boys are big chocolate chip fans and since they were eating these as treats I increased the amount. The dough was hard to work with when first combined so I set the bowl in the fridge for a 1/2 hour. After it had cooled I formed the dough into balls and flattened them slightly before adding to the baking sheet. These cookies are a little more adult oriented. My husband liked that they weren't overly sweet, but my two boys weren't fans of the brown sugar. The cookies do have less sugar than most cookie recipes, which was a bonus to me, but a downside for my kids. My husband would rather not of had the dried cranberries, he would have preferred dried cherries instead. This is a recipe that could easily be modified to include other dried fruits or chocolate chip flavors. For the recipe go to Oatmeal Cranberry White Chocolate Chunk Cookies. These cookies look fantastic! Cranberry and white chocolate...my..they remind me of X'mas. Totally love it. Thanks :) They remind me of christmas flavors too! I agree, I want my boys to realize that I was active in their childhood! This recipe looks delicious. I love anything w/cranberries it it! I definitely look like my father :) I appreciate it more as I've gotten older, especially after I lost my mother. I relish that I have my looks to remind me of my family! I love that they have less sugar in them (I'm not a big fan of overly sweet desserts); they just make me thirsty too :o) These look fabulous! My husband isn't a fan of overly sweet desserts either, which is why he liked this recipe! Are you really trying to kill my diet! LOL! I want these cookies! I promise I'm not :) They are good though! These look so good!! I love oatmeal cranberry cookies, I have to try them with white chocolate! The white chocolate really does add great flavor! I didn't mind it when I was younger but as I got older and gained weight I have been avoiding getting my picture taken. It doesn't help that I'm usually the one holding the camera. But you're right, I should get over this, I'm sure my kids don't mind the extra weight I'm carrying now. And those cookies look so yummy! Pinning this for later! I'm normally the one holding the camera too :) Thanks for the pin, I appreciate it! Cookies sound amazing, and YOU are gorgeous, inside and out! Hi Ann: Good for you. I noticed it right away. Your blog was different, felt different, even. I think having your picture there helps me make a connection with you. I've been following and enjoying your blog for a while now. You look wonderful, by the way. Love those cookies. I'll definitely have to give them a try. A lot of people have been telling me that :) Thanks for the sweet comments, I am slowly getting used to having my face out there! Ann, I can totally relate to not wanting photographs taken, and I think it is lovely that you are stepping in front of the camera for your boys. You are a wise woman (with absolutely the most perfect complexion!). I know your boys will be happy to have more mom pics. Now onto those cookies. Girl, you know I am going to have to pin and like these babies. They look incredible. Thank you for sharing!!!! My complexion was horrible as a teenager, but I am deligent about moisturizer now in my 30's :) My mother had beautiful skin into her 60's, I would be so happy to look as great as she did! Thanks for the pin and sweet comments, I really appreciate them! Thanks for the heads up, entered my link :) Have a great weekend! Yay! I'm so glad you put a photo up of yourself! It was the first thing I noticed when I visited today. Its great to see an image of you, it really helps me connect and get to know you better. Well done. The cookies also look fabulous! I'm slowly getting used to having it up :) I'm glad that it's helping people to feel more of a connection! 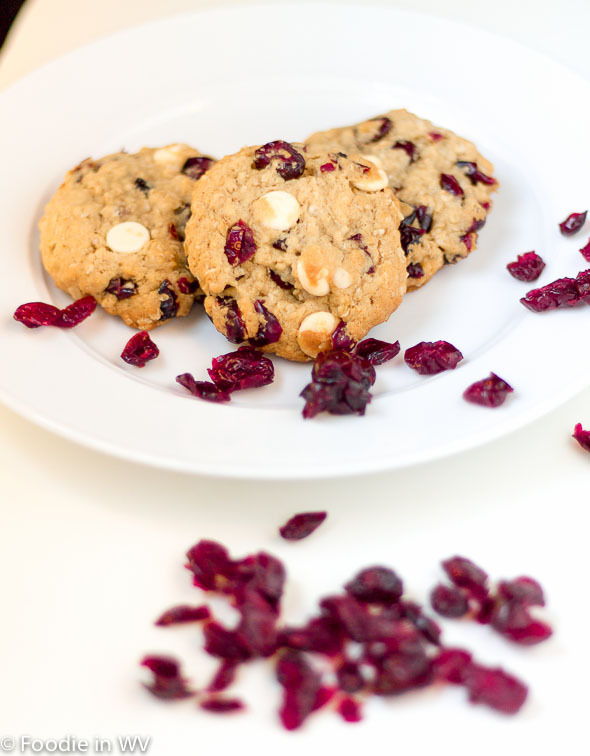 I love oatmeal cookies - especially with cranberries! Thanks for the pin, I really appreciate it!